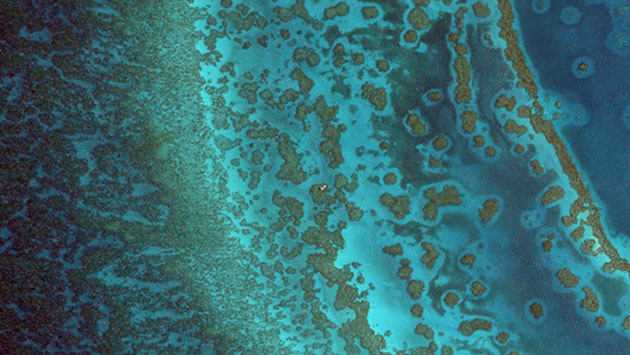 A birds-eye view reveals the mosaic of coral and sand on a reef. WorldView-2 imagery from DigitalGlobe, Inc.
NASA’s Earth Venture Suborbital-2 Program has awarded BIOS scientist Dr. Eric Hochberg a grant to initiate the COral Reef Airborne Laboratory (CORAL). The three-year project will use an instrument mounted within the belly of an airplane to survey reefs around the world. By using airborne data to calculate the amount of coral present on a reef, and to assess the processes underpinning coral reef growth or decline, CORAL provides a new and unprecedented perspective on coral reef ecosystems. Beginning in 2016, CORAL will assess reefs in Florida, Hawaii, Palau, the Mariana Islands and Australia’s Great Barrier Reef using the Portable Remote Imaging Spectrometer (PRISM). While a consumer digital camera captures red, blue, and green wavelengths of light to form images that human eyes can process, PRISM was developed by NASA’s Jet Propulsion Laboratory (JPL) to capture hundreds of additional shades of color from the spectrum of incoming light, and specifically designed to collect this data over coastal waters. The CORAL science team will process and interpret the complex spectra captured by PRISM. By developing algorithms to account for ways the atmosphere and water filter light, the team will identify the unique spectral signatures of corals and algae as they absorb some wavelengths and reflect others. These spectral signatures will be used to catalogue the relative abundance of coral, algae, and sand over entire reefs in the Atlantic and across the Pacific. “It’s taken nearly twenty years to develop the underlying coral reef science, to develop the science behind the spectral signatures, and for the technology to actually make this possible,” said Hochberg. Balanced coral reef ecosystems, renowned and highly valued for their biodiversity, are a mosaic of coral, algae and sand. 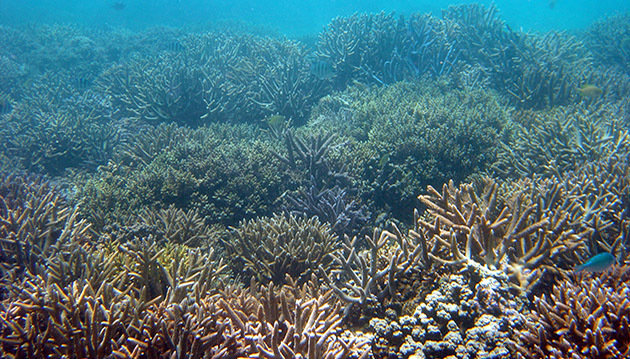 When the system is disturbed, algae often begin to engulf the dying corals; if reef-building corals do not rebound, the reef structure built over thousands of years will erode into rubble. As living coral is lost, a plethora of organisms lose their habitat or sustenance and the entire reef ecosystem is radically – and at some point irrevocably – altered. Therefore, scientists consider the amount of living coral present on a reef an indicator of reef degradation and recovery. While underwater divers can only survey a fraction of a percent of the total reef, CORAL’s airborne surveys will collect coral cover data on a spatial scale a thousand times larger. Furthermore, it is estimated that thirty percent of the world’s coral reefs may already be degraded as a result of pollution, warming coastal waters, destructive fishing, and other human impacts, but it is very difficult to use those factors to clearly explain the amount of coral present on a reef. Nor do physical variables like light, waves, or seawater acidity clearly explain the amount of coral on a reef. Hochberg argues the lack of relationships indicates the need for expanded, uniform studies. Additionally, other variables – like the rates of calcification as corals lay down their skeletons, and the amount of solar-fueled primary production providing sustenance for the complex reef food web – may be strong predictors of coral reef condition. The image above illustrates the CORAL approach. Mounted in the belly of an airplane, PRISM will record the spectra of light reflected upward toward the instrument from the ocean below. Its very high spectral resolution is then used to identify reef composition (i.e., coral, algae, and sand) and model primary production. CORAL is explicitly designed to overcome these gaps in our understanding of reefs. The scale of the surveys will increase the amount of data available to test relationships between coral cover and environmental conditions or human impacts on each reef. The spectral data will enable scientists to test relationships between coral cover and ecosystem-wide rates of primary productivity and calcification on each reef. Hochberg has assembled an interdisciplinary research team to achieve the goals of CORAL, including shallow water remote-sensing experts, top coral reef biologists and biogeochemists, and experts in remote imaging spectroscopy. His ten co-investigators come from nine U.S. research institutions, and additional collaborators from Australian institutions will be contributing to the project. By providing PRISM, engineering support, and project management for the airborne campaigns, JPL brings integral support to CORAL. “It’s very exciting that we’re finally able to address these fundamental coral reef questions,” Hochberg said.